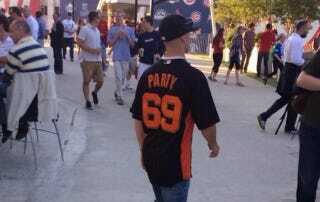 When Is a "Party 69" Jersey Appropriate? The answer to that question is almost certainly "never," but let's keep open the possibility that this jersey is somehow acceptable in at least one situation. Siths and absolutes, and all that. Still, we can safely say that the hypothetically palatable "Party 69" jersey-wearing situation is not a game between the Nationals and Reds. Yet, here we are. Now, Casanova at least has geography* on his side—since the Orioles and Nats play less than 40 miles apart from each other—but this just brings up another weird jersey decision, one that many people make every day. Some people just go to a game and wear any jersey, even for teams not currently playing in that stadium. It's like they want you to know they're definitely a fan of the sport, just not a fan of the two teams they happen to be watching. It's not against the rules or anything—there are no rules, we're talking about clothing—it's just a strange thing to do. This guy's strangeness has multiple angles, though. He went to see the Reds play the Nats in D.C. and wants you to know he's down to party, sexually, but also that he is a fan of baseball as played by teams other than the Nats and Reds. *Update: It's likely that this is a Giants jersey, making it even less sensical.